Opening: This is Wooliam. He is a sheep. You will note that Wooliam is reading. There are not many sheep who read. But Wooliam is one of them. Summary: (from the publisher): Baabwaa is a sheep who loves to knit. Wooliam is a sheep who loves to read. It sounds a bit boring, but they like it. Then, quite unexpectedly, a third sheep shows up. A funny-looking sheep who wears a tattered wool coat and has long, dreadfully decaying teeth. Wooliam, being well-read, recognizes their new acquaintance: the Wolf in Sheep’s Clothing! The wolf is so flattered to discover his literary reputation precedes him that he stops trying to eat Baabwaa and Wooliam. And a discovery by the sheep turns the encounter into an unexpected friendship. I like this book because:The whimsical watercolor-collages are cheerful and satisfying, as I always note them to be in Melissa Sweet’s books, but this time I am especially enjoying the character designs. I want to camp out with these three! But the storytelling! Ahh! It’s the sort I might call cheeky if I new exactly how the British apply the word. In any case it takes me back to stories I’ve read to my children just before they started reading early chapter books on their own, where they had more patience and could soak up all the goodness of a well-layered sense of humor. Have I sold you yet? Resources/Activities: read a book, learn to knit a scarf (check out THIS video), then head out on an adventure – birdsong included. Pack a lunch to take along, unless you like eating grass; make a map of where you’ve been, like the one on page 8; read multiple wolf-themed books so you too can recognize one when you see it! 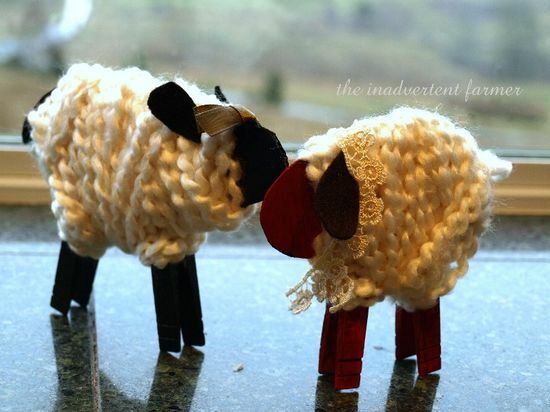 Make a sheep craft, like the one below – more info HERE.